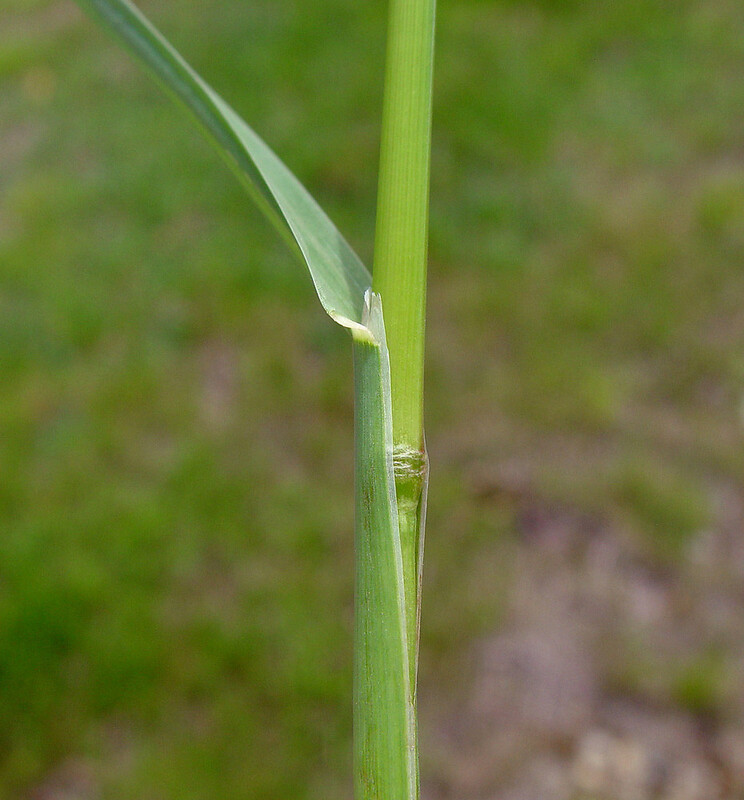 Dactylis glomerata stem and ligule. By Arthur Haines. Copyright © 2018. New England Wild Flower Society. gobotany.newenglandwild.org (Accessed /2018). Dactylis glomerata is a perennial C3 grass (Wilson and Hartnett. 1998; Basinger 2002), clumped, coarse, 50 cm to 1.2 m, rather pale blue-green; leaf sheath rough, compressed, ligule 0.5-0.7 cm. Leaves alternate, elongate, wide, 0.3-0.8 cm, somewhat folded along midrib, basal leaves often semi-evergreen. 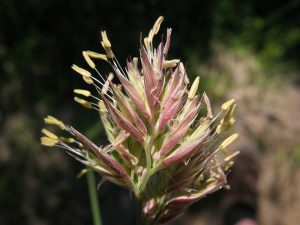 Dactylis glomerata inflorescence. By Donald Cameron. Copyright © 2018 Donald Cameron. New England Wild Flower Society. gobotany.newenglandwild.org (Accessed 2/2018). 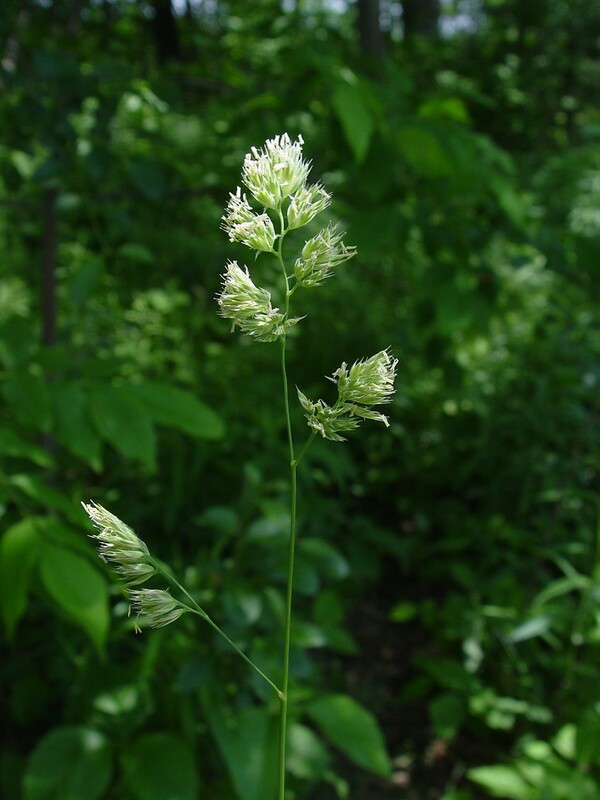 Flower spikelets flat, in one-sided clusters, 3-6 flowered, about 0.5-0.8 cm long; Inflorescence 10-20 cm long, branches few, irregular; spikelets pale gray-green, flattened, in dense, irregular tufts at ends of wiry, naked stems; blooms May-June, later turning pale tan. Seeds eaten by birds (Martin et al. 1951). Habitat: Disturbed upland woods, partly shady roadsides, meadows; tolerant of shade, soil pH 5-7.5, moderately tolerant of salt, drought, fire (USDA, NRCS 2010). Appears to prefer high nutrient soils. Notes: Plants eaten by deer (Martin et al. 1951). Often infected by the endophytic fungus Epichloë typhina (Clavicipitaceae, Ascomycetes). 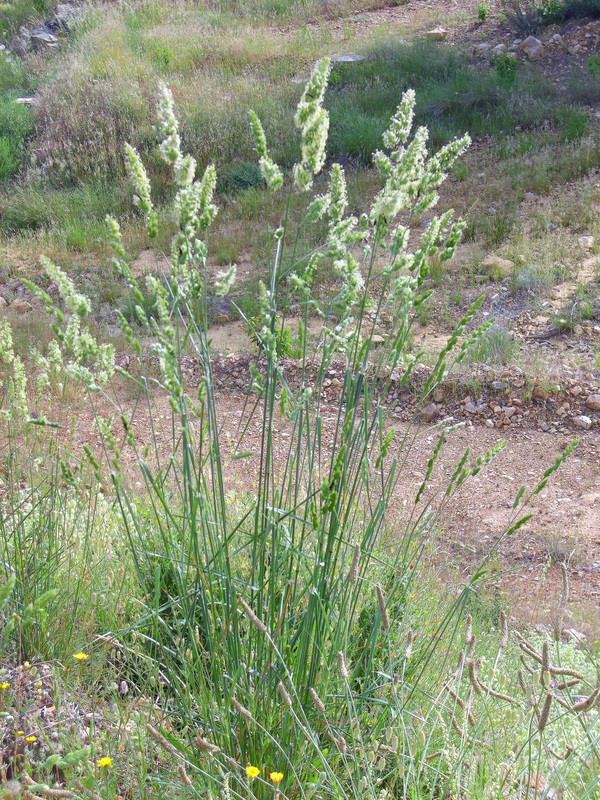 The fungus may help protect the plant from herbivores but may also render it sterile by replacing seeds with fungal tissue (Clay and Leuchtmann 1989; Schardl and Leuchtmann 1999).Resprouts and blooms again if mowed.